Since we opened our doors in 1956, our services, programs and community partnerships have evolved to meet the changing needs of an ever-growing population of older seniors. 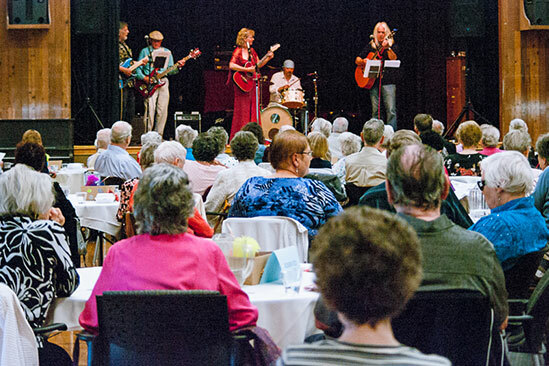 Silver Threads Service (STS) currently operates two senior activity centres with support from the City of Victoria and the Municipality of Saanich. In Victoria the centre is located at 2340 Richmond Road and in Saanich the Les Passmore Centre is located at 286 Hampton Road. As well STS offers outreach programs in various locations across Greater Victoria. The majority of our clientele are seniors, but our doors are open to everyone. We also serve the community at large – individuals who call or stop by our activity centres for information and referrals. These include caregivers of seniors, family members of seniors, and other seniors in general who are not registered in any of our programs. We work with government, business and individuals to ensure a higher quality of life is achieved by promoting a senior-friendly environment on a day-to-day basis. Seniors in Greater Victoria are engaged and supported, enhancing their quality of life. The Guess Who’s Coming to Dinner program operates out of the Saanich Silver Threads Service on the 1st and 3rd Wednesdays of the month. A full hot entrée and dessert is prepared by our Chef, followed by entertainment. The purpose is to provide an affordable meal and the opportunity to connect with others in a relaxed and welcoming setting. The dinner is attended by 80 to 120 seniors over the age of 65. Many of our guests are older seniors who are trying to remain independent and in their own homes. For these clients we coordinate volunteer drivers who pick them up, attend the dinner and drive them home after. For this group the Guess Who’s Coming to Dinner can be the only social event they attend. Be the exclusive sponsor for one or more of our Guess Who’s Coming to Dinner events ensuring your business will be highly visible to 80-125 senior guests. Plus not only will you have direct contact with those 80-125 seniors who attend the dinner but also exposure through our newsletter (both digital and print) reaching 500+ seniors and community stakeholders. The information you share will provide value added service for our seniors. As a sponsor you will have direct contact with 80 to 125 seniors who attend the dinner as well as exposure through the newsletter both digital and print to 500+ seniors and community stakeholders.